Announced in January 2001, the PowerBook G4 was a dramatic change to Apple's PowerBook line. Based on a new low-power G4 chip, the PPC 7410, the PowerBook G4 sported a stylish new Titanium enclosure, which was only 1" thick, .7" thinner than its predecessor, the PowerBook G3 (FireWire). The reduction in size came at a price, however: the PB G4 had a fixed, 6x slot-load DVD-ROM drive instead of a removable drive bay, and a single battery bay (previous models allowed the use of the drive bay as a second battery bay). 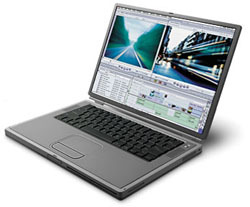 The most innovative feature of the PowerBook G4, was its wide-aspect 15.2" screen, which had a native resolution of 1152x768. This made the PB G4 wider than its predecessor, but it was over an inch less deep. The PowerBook G4 shipped in two configurations. The 400 MHz model, with 128 MB of RAM and a 10 GB hard drive was $2,599 (a $100 increase in the low-end model price), and the 500 MHz model, with 256 MB of RAM and a 20 GB hard drive was $3,499. In mid-2001, These prices were reduced to $2,199 and $2,999, respectively.